The questions start out relatively easy, and most in the class knew the answers, and were ready and willing to respond. But I knew as I progressed through the questions that there was some confusion. Perhaps many of us are likewise stumped when it comes to these questions, or we may think we know the answers when we don’t. One of the best talks I’ve ever heard on the subject was given by Elder Dallin H. Oaks in the Priesthood Session of this last April 2014 General Conference entitled “The Keys and Authority of the Priesthood.” Another excellent discourse on the topic was given by Elder Neil L. Andersen, “Power in the Priesthood,” in the October 2013 General Conference, which, incidentally, we also listened to in full in our combined Elders and High Priest quorums today. I will focus on the talk by Elder Oaks, as I think it greatly helps to reiterate a lot of what we know about the priesthood and how it functions in the Church, but also clarifies how the priesthood relates to women, which is profound. Elder Oaks begins by discussing how we do not “step down” or “step up” when we are called into callings in the Church. There is only “forward or backward,” as he illustrated by a former stake president and his wife being called as nursery leaders in their wards. How true is that. We do not aspire to “higher” callings in the Church (or “lower” for that matter), because there are none. We serve where we are called, wherever that may be, and this helps the work of the Lord move forward. He continues by quoting Relief Society general president Linda K. Burton who said that we all need a greater desire to understand the priesthood. Indeed we do. Sometimes there are things we think we know, but we really don’t. There are certain aspects of the priesthood that I think few of us truly understand, but we receive line upon line. Elder Oaks leads us from one point to the next, starting with the priesthood keys and then to the authority, to teach us some great truths about the priesthood, and particularly as it relates to women. Priesthood power blesses all of us. Priesthood keys direct women as well as men, and priesthood ordinances and priesthood authority pertain to women as well as men. This is true, on several levels. It is true that the priesthood blesses all of us, whether man or woman. The keys, in particular, direct women and men. But I thought his last statement, that the ordinances and authority pertain to women as well as men, was particularly insightful. On a more subtle level it introduces us to the topic that he has prepared. The word choice of pertain is important. Pertain has several meanings, most commonly to “be appropriate, related, or applicable.” But I think it’s interesting that Elder Oaks comes from a law background, which helps to shape his words in a certain way. Formerly a law professor, justice of the Utah Supreme Court, and even considered a prospect for a seat on the U.S. Supreme Court, he is well acquainted with law, and it often comes through his speech and writings. Even the talks he gives, such as this one, are organized into sections with roman numerals, as articles or sections of a bill of law. When trying to understand his words, it might be helpful to view them in terms of how they are considered in the world of law. Pertain, in a law sense, means “belong to something as a part, appendage, or accessory,” as in the assets pertaining to a business, or belonging to that business. Synonyms include “belong to,” “be a part of,” or “be included in.” It is in this sense that I think Elder Oaks meant when he used the word. Priesthood ordinances and authority belong to women as well as men. Both men and women take a part in the ordinances and authority of the priesthood. This was spelled out more clearly as Elder Oaks continued. The power of God delegated to man by which man can act in the earth for the salvation of the human family. Of course, often when the word man is used, it is meant to mean mankind, or those in the human family, male and female, and is not gender specific. This quote might be more helpfully understood in this context. The priesthood is also the ultimate power upon the earth, even the power by which it was made. It is the power that enables the resurrection. Priesthood keys are the authority God has given to priesthood [holders] to direct, control, and govern the use of His priesthood on earth. The Lord has directed that only men [males] will be ordained to offices in the priesthood. The keys are so given to men in these offices to direct, control, and govern the use of the priesthood. Every act or ordinance performed in the Church is done under the direct or indirect authorization of one holding the keys for that function. A priesthood “holder,” or any other member for that matter, could not do anything within this church without the authorization of those who hold the keys, no matter if they have the priesthood, hold an office, or otherwise. The keys designate how the priesthood is allowed to function on the earth. Without the keys, any church function would not be possible, or at least invalid. the function of priesthood keys… limits by directing who will be given the authority of the priesthood, who will hold its offices, and how its rights and powers will be conferred. For example, a person who holds the priesthood is not able to confer his office or authority on another unless authorized by one who holds the keys… This explains why a priesthood holder—regardless of office—cannot ordain a member of his family or administer the sacrament in his own home without authorization from the one who holds the appropriate keys. The High Priest Group Leader does not hold keys, as the Stake President is the president of the high priests quorum in a stake. Neither do the first and second assistants in the priests quorum have keys, as the bishop is the president of that quorum. Members of the quorums of the seventy do not hold keys either. Counselors do not hold keys. Other auxiliary presidents and presidencies do not hold keys. With the exception of the sacred work that sisters do in the temple under the keys held by the temple president, which I will describe hereafter, only one who holds a priesthood office can officiate in a priesthood ordinance. This is notable. 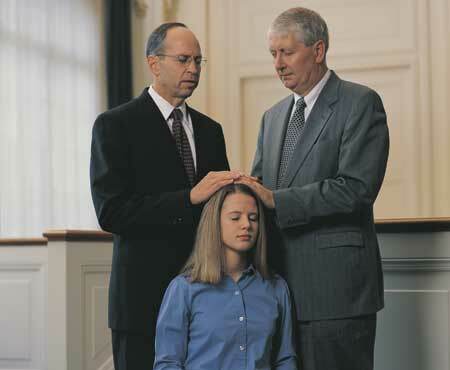 In general, only those who hold a priesthood office can officiate in a priesthood ordinance, such as baptism, confirmation, giving a blessing, ordaining others, etc. But there is an exception. As those members who have been endowed in the temple will recognize, women within the temple officiate in priesthood ordinances. Full stop. Think about that. As we will see shortly, women do so with priesthood authority, acting under the direction of the keys held by the temple president. But that is not the only place where women exercise priesthood authority. The priesthood ultimately belongs to Jesus Christ, whose priesthood it is, and who holds all the keys of that priesthood. He determines which keys are given to men on the earth, and how they are used. But, as Elder Oaks notes, not all the keys are present on the earth today, but only those of this dispensation. There are other keys that are not on the earth, namely keys of creation and resurrection. Only the prophet and apostles hold all the keys of this dispensation on the earth today, but the prophet is the only one authorized to exercise all the keys. The prophet delegates these keys to the other leaders who hold the keys necessary to preside in their responsibilities. This is important to recognize. President Thomas S. Monson, his counselors, and the Quorum of the Twelve can decide on many matters of Church administration, but they cannot change the pattern of the priesthood. There is only One who can change the priesthood, and that is the Lord Jesus Christ, whose priesthood it is. Any change to the priesthood pattern the Lord has given the leaders of the Church, namely male-only ordination to priesthood offices, would need to come by revelation. …since the scriptures state that “all other authorities [and] offices in the church are appendages to this [Melchizedek] priesthood” (D&C 107:5), all that is done under the direction of those priesthood keys is done with priesthood authority. Yes. All that is done under the direction of those who have the keys is done with priesthood authority. All. Elder Oaks goes on to note in quoting President Joseph Fielding Smith that women receive authority in the Church, even authority to do binding ordinances essential to our salvation, “such as the work that our sisters do in the House of the Lord.” These ordinances are just as binding and sacred as those done by men. …the Church work done by women or men, whether in the temple or in the wards or branches, is done under the direction of those who hold priesthood keys… [the] Relief Society is not just a class for women but something they belong to—a divinely established appendage to the priesthood. This is profound. Indeed, what other authority would it be that these women are acting with in the Church, if not priesthood authority? There is no other authority in the Church; it is all priesthood authority. Any woman who receives any calling within the Church and is set apart by an ordained priesthood holder who has been authorized by those who hold the keys, receives priesthood authority to act in that function in the Church. Priesthood authority is given to her to do her work. The woman then holds priesthood authority in that function, and can exercise that priesthood authority in the duties and responsibilities of that calling. A woman who is set apart as a ward choir director has been given priesthood authority to carry out that responsibility within the ward. A sister who has been called as a Young Women President receives priesthood authority to perform her calling and responsibilities for the young women. A woman called as a primary teacher has priesthood authority given her to fulfill the duties pertaining to that calling. And so on. Whoever exercises priesthood authority should forget about their rights and concentrate on their responsibilities. That is a principle needed in society at large. The famous Russian writer Aleksandr Solzhenitsyn is quoted as saying, “It is time … to defend not so much human rights as human obligations.” Latter-day Saints surely recognize that qualifying for exaltation is not a matter of asserting rights but a matter of fulfilling responsibilities. Having been a Utah Supreme Court justice, Elder Oaks is well qualified to speak about about human rights. We can focus so much on what we perceive as our rights that we can lose our ability to fulfill the ends of those rights. As Elder Oaks emphasizes, “men are not ‘the priesthood. '” They never have been. “Men hold the priesthood, with a sacred duty to use it for the blessing of all of the children of God.” Women too hold and exercise priesthood authority in their callings within the Church. Gender is an essential characteristic of individual premortal, mortal, and eternal identity and purpose… By divine design, fathers are to preside over their families in love and righteousness and are responsible to provide the necessities of life and protection for their families. Mothers are primarily responsible for the nurture of their children. In these sacred responsibilities, fathers and mothers are obligated to help one another as equal partners. President J. Reuben Clark noted that women “are builders and organizers under [priesthood] power.” These are some of the important roles that women have within the Church, responsibilities that they are entrusted with by the Lord Jesus Christ. Unlike priesthood keys and priesthood ordinations, the blessings of the priesthood are available to women and to men on the same terms. The gift of the Holy Ghost and the blessings of the temple are familiar illustrations of this truth. As I’ve noted elsewhere, men and women, as husband and wife, may also receive priesthood power together within the temple. This has sometimes been called the patriarchal order of the priesthood, or the fullness of the priesthood. It is available to those who are faithful to the Lord in all things. It is this priesthood authority that Heavenly Father and Heavenly Mother exercise in bringing to pass the immortality and eternal life of man. So do women have authority in their Church callings? Do they exercise priesthood authority in the Church? Do they hold priesthood authority to do their work in the Church and kingdom of God on the earth? Yes. Yes. Yes. Elder Oaks helped to make this clear. I’m grateful for prophets and apostles in these latter-days who lead and guide us, and teach us the truths of the restored gospel of Jesus Christ. An argument could be made that all Aaron Priesthood offices hold the keys of the ministering of angels. One thing that you touched on briefly is the fact that the only thing that Priesthood holders can really do is serve others with it. I can’t ordain myself to a calling or give myself a blessing. I can only do things for other people. Anyone who aspires to a “higher” calling (as they see it) is insane. Apparently they have never been a bishop or stake president.